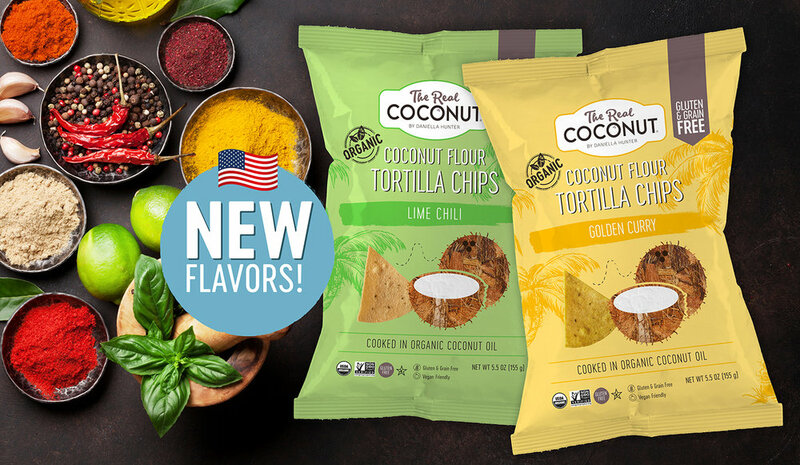 Since we launched our new line of Coconut Flour Tortilla Chips into stores earlier this year, we have had fantastic response from our distributors and their retailers. Trade Shows and Press are calling us out at one of the hottest trend products of the year. Now we are happy to announce the release of two new flavors into our line - Lime Chili and Golden Curry. Daniella Hunter’s mission has been to support long term digestive gut health using plant crops to create light, fresh, airy chips that are easy on your body, good for your mind and sustainable for the environment. Not to mention they will get your taste buds dancing too! Our two new flavors, Golden Curry and Lime Chili, are destined to become new favorites as they are both bold, bright and flavorful once you take your first bite! Be sure to be on the lookout to buy our chips at local grocery stores near you! You can also order our chips online here therealcoconut.com/shop. We know they will become a staple in your kitchen! Newer PostCHANGING THE WAY WE WRAP!